With dark tainted wooden beams, pastel walls and touches of gold, the Lautrec Suite has a modern Parisian feel to it. Lit by 2 vintage crystal ceiling lights, the living room is furnished with an authentic 1960 Knoll sofa paired with a Ligne Roset glass coffee table, a Louis 16 light blue chair and a 1950 golden Italian dresser. High end Le Lièvre curtains garnish all 3 windows and the Suite has 2 Kilim rugs. 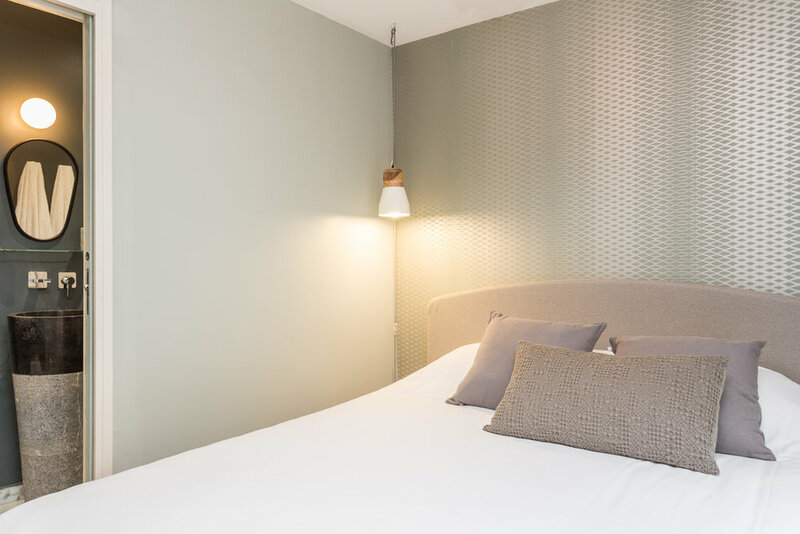 REFINED BEDROOM with a sober Cole & Son geometric print wallpaper and designer bed lights. The double bed is signed André Renault, a luxury French bedding firm. POLISHED ENSUITE BATHROOM with a white Carrara marble Italian shower, black marble sink and Artemide lighting. The Lautrec suite is equipped with flat screen TV, Cable and Nespresso machine.